We all know that Hawth’s Tools for ArcGIS was a handy extension that could do almost anything. Counting points in polygons. Calculating distances between points. Creating random selections. Analyzing animal movement patterns. These were functions not found in traditional Esri ArcGIS software. Hawth’s Tools moves to a new extension and name for ArcGIS 10. It brings improved functionality and user interface to the table. 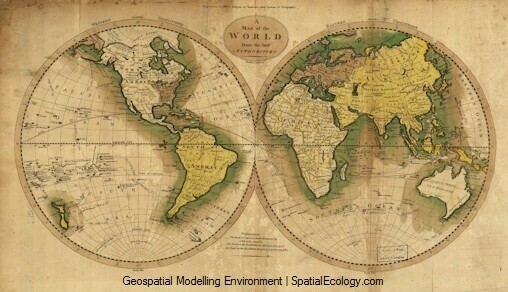 The new Hawth’s Tools is called the Geospatial Modelling Environment (GME). So what is GME all about? Because we all know Hawth’s Tools was a really useful add-on to ArcGIS, you’re going to notice a lot of the same features remain in GME. But GME adds more tools to a GIS analyst tool belt. An assortment of movement, conversion, geometry and statistical tools have been added to GME. These tools are all searchable in the GUI. Commands can also be filtered by category. ArcGIS has lacked some of the full functionality that you can get from a statistical package. This is why GME integrates itself with the open source R statistical package. R goes beyond the traditional statistics found in Esri ArcGIS. GME leverages R statistics making these functions available through commands. This makes GME a powerful tool for not only statistical analysis but also graphing relationships with scatterplots, boxplots and histograms. One of the biggest positives of Hawth’s Tools was how it was being actively maintained. Hawth’s Tools (named after the creator Hawthorne Beyer) stood out because of the efforts from its developer. GME is worth a look because it gives the ability for users to obtain better answers to GIS related questions. Check it out on the spatial ecology website.